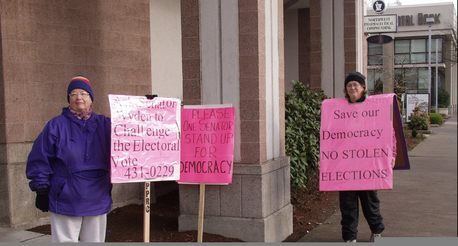 The final push is on to tell Senator Wyden that we won't stand for dishonest elections! As you know from previous emails, we have started a vigil of Senator Wyden’s office to convince him to step forward on January 6th (this Thursday) and reject the certification of the electoral college on the floor of Congress. There are already plans by Rep. John Conyers (D-MI) to step forward and challenge the same. He will certainly be joined by other brave Representatives, but, as yet, no Senator has pledged to step forward. There is hope still to encourage our own Sen. Wyden to be one of the Senators that step forward. (We hope he won’t be alone this time!). How can you accomplish this? ALSO: Lobby the local news media to cover this issue and the vigil of Sen. Wyden’s office! Let them know you are very concerned about the validity of the Nov. 2nd Presidential election, especially in key swing states like Ohio and Florida. Last night, along with her latest press release, Sarah Gray wrote to me about how she is doing after eight days of being on her hunger strike. She also sent two pictures from her vigil outside Senator Wyden's office in Eugene, Oregon. As I wrote to her in my reply, if only our elected leaders would show the same commitment to democracy that she has. If you support what she's doing, please drop Sarah a line at vigil@truthinvoting.org to let her know. Here is Sarah's email to me (published with her permission), followed by the two pictures. Thanks for your kind support. I'm sending you my first press release and one that will be sent out tommorrow to local media. Thank you for helping me spread the word. We are hoping for a large group at Wyden's office on Monday January 3rd when his office reopens, it's been closed since the 24th of December. We've been walking, standing and sitting outside his office building everyday since Dec.23, for two hours in the morning and two hours in the afternoon. 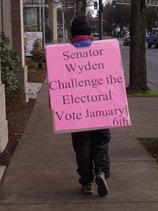 I'm wearing a sandwich sign asking Senator Wyden to challenge the vote. It is a high traffic area and people can't miss our signs. The pictures attached were just emailed to me but I'm not able to open the file, perhaps you'll have better luck. The fast is going well, my energy level is better now than day 4 and 5 and I don't feel hungry very often. UPDATE: This hunger strike is really an effort of two. Sarah informs me that the woman pictured with her, below, is her partner, Carrie Andrews. "She is my rock," Sarah writes. "I couldn't be doing this without her 24 hour a day support. Her commitment to this project has made it possible for me to keep fasting and stay healthy." On January 6th, when the Electoral College is to be certified by the US Congress, a number of members of the House of Representatives will contest the results from Ohio based on many report of voter irregularities. The process requires that one Senator stand with them in requesting an investigation. On December 22, 2004, Gray delivered a letter to Senator Wyden’s office reminding him that this is a time sensitive issue and that citizen’s require a timely response. She began her fast in front of his office on December 23. Gray is concerned that we are going through a repeat of the election debacle of 2000 when investigations eventually turned up extensive evidence of fraud. When members of the House of Representative challenged the vote in January, 2001, not a single Senator came forward to join them. This year once again members of the House have challenged the validity of the election, but no Senator has joined them. Gray is committed to continuing the fast until the January 6 certification of the election is stopped. “ Our voices must be heard and our votes counted or our democracy is dead”, says Gray. 2) Online: Sign the key online petition we believe to be the highest priority at this time: http://www.house.gov/judiciary_democrats/contact.html (see below for more information) Donate money to the organizations planning Jan. 3rd rally in Columbus, January 2nd-6th March on Washington, and January 6th Defend Democracy Rally and Vigil in Washington DC, contesting election and fighting for recount in Ohio, and lobbying senators and congresspeople to step forward on Jan. 6th and challenge Ohio electors. 3) Meeting: Our next action/organizing meeting will be : WHEN: Monday, Dec. 27th at 6:30 PM WHERE: the EWEB Training Room (500 East 4th - in North Building) Please come and bring your enthusiasm and ideas. We will share news, further discuss lobby efforts and discuss ideas for plans for beyond Jan. 6th. Please use this language when calling/writing/faxing or visiting Sen. Wyden's office: We respectfully ask Senator Ron Wyden to support a formal challenge to the electoral college on January 6th, 2005. ALSO: A woman not associated with Truth In Voting (Sarah) has started a hunger strike and silent vigil outside the building where Senator Wyden's Eugene office is located. If you would like to show your support, please stop by the 151 West 7th building any weekday between 3 and 6 pm and say hello and stand with her in solidarity. She is asking the same thing we are: that Sen. Wyden "refuse to ratify the Congressional certification of the Electoral College on Jan. 6th, 2005." She has indicated that she will fast until the day of that vote. For more information, call her at: 541-514-3267. ACTION ITEM 2: Emails. Email your senators and congressperson, and as many other senators and congresspeople as you can, about not seating the Ohio electors until a full congressional investigation of the election in Ohio has been completed. For an excellent interview with Rep. Conyers, who is leading the congressional effort for such an investigation: http://www.truthout.org/docs_04/122204W.shtml# Go to http://www.votecobb.org for more updates. the Electoral College on January 6th, 2005.
to schedule a conversation with him. " election, but no Senator has joined them. Gray is calling on Senator Wyden to empower the call for an investigation: "
brought by Members of the House of Representatives", she said. or our democracy is dead", says Gray.